New Delhi, Feb 7 (IANS) Congress leader Mallikarjun Kharge on Thursday accused the government of using the President's address to the joint session of Parliament for political "gains" and dubbed it a compilation of Prime Minister Narendra Modi's speeches in rallies. 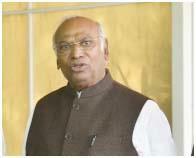 Speaking in the Lok Sabha on the motion of thanks to the President's address, Kharge criticised the government's actions like demonestisation, GST implementation and the Rafale fighter jet deal and said that the BJP came to power in 2014 by "misleading the people which it is still continuing". "This was not President's address. It was a compilation of Prime Minister's speeches in rallies. Here is a Prime Minister who never listens to anyone but keeps talking about himself. The use of President's address for political gains shows that how low this government can stoop to save its deteriorating reputation," he said. "This government is not working according to the Constitution. Issues are not being discussed in the Cabinet. Whatever Modiji says, that happens," he said referring to the Constitution amendment Bill that provides 10 per cent reservation for economically poor among general categories. "At least give us the credit for our work. But you won't give us credit because you are full of hatred. Despite our doing so much work, you allege every now and then that nothing has happened in last 60 years," the Congress leader said. He listed the Congress's achievements in the form of reducing illiteracy and infant mortality rate while it took several measures like green revolution, establishing educational institutions and many other pioneering measures. "We developed this country as self-dependent, competent and one with self respect. We strengthened the democracy and saved the country. You came in power by making false promises but you did not stop here. You are continuously lying. Because it has been in your habit," he said. Hitting out at government over the farmers' plight across the country, he said it did nothing for the farmers in the last five years. "Why are you not writing off the farmers' loans when you can waive Rs 1.10 lakh crore of loans of industrialists. You did nothing for the farmers. You did not even implement the promises for them. Now, when you are going to face elections, you are trying to give them something. But this is not going to work," he said.